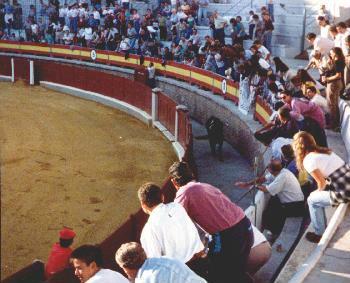 While in Granada in September 1994, I was able to witness a special bullfight during a religious holiday that featured a special procession of candles. 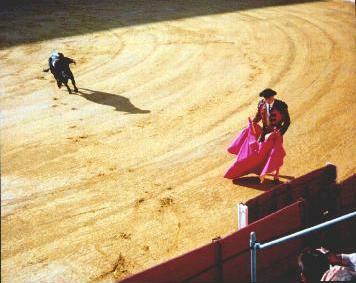 This bullfight was held as one "sin picadores," where the bulls are able to maintain their strength longer since they do not have to bear the pain of those darn pics. Nevertheless the bulls were very frisky on this day and really didn't need to be spurred on to try to get the matadores. First you have to choose to sit either in la sombra or el sol (sun or shade) and you pay more if you choose shade. On this day there were 6 bulls and 3 matadores (each matadore getting a crack at two bulls). The poor bulls did eventually bite the dust and the death of such a large animal that seemingly moments ago was a prize combination of power and spirit had quite a profound effect on the emotions of even the locals. In the spirit of fairness though, I can say that each matadore was struck rather soundly at least once during the show. When the matadore would perform his tour of the stadium after each kill you could see the great effort he was making not to show his pain. A very unusual thing happened during this fight that you can see on the right. One bull was so frisky that he jumped right over the fence and into the alley where the workers are. It caused quite a stir as you can imagine, but added some badly needed comic relief. You can see on the left the special team of helpers that come in to cart away the bull after he has succumbed to his fate. On the right is the matadore and his contingent celebrating the coup de gras.